Kingston based choir She Sings will perform at Trinity United Church on Feb. 10. 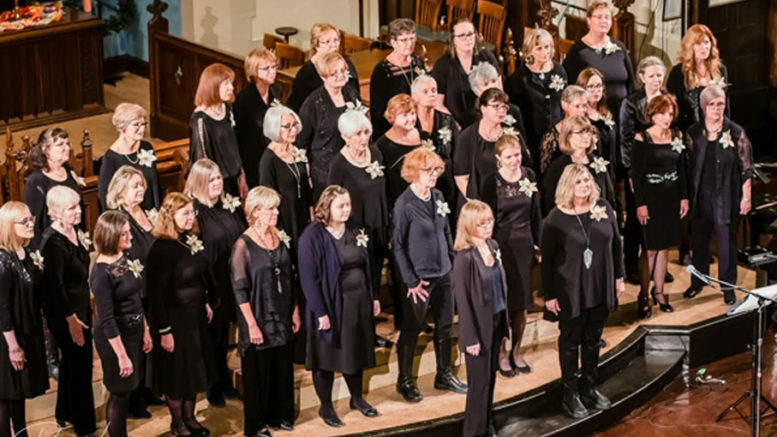 Playing on the Valentine’s Day theme, Trinity United Church will host its first of an ongoing concert series on Feb. 10 titled Songs from the Heart, featuring She Sings Women’s Choir and the Kingston Youth Choir. Conducted by Martha Hill Duncan, She Sings is a 50-voice auditioned women’s choir that has premiered and recorded several award-winning choral works. Based out of Kingston, they have travelled to New York City and Stratford and delivered a unique performance in a Napanee barn in sub-zero temperatures. They’ll be joined by the Kingston Youth Choir, which has joined other ensembles such as the West Island Youth Symphony Orchestra of Montreal and the Shoestring Opera Company from Toronto. They’ll be directed by Emily McPherson and feature singers aged 12-19. Formed in 2016, they’ve already made quite a name for themselves on both the local and provincial choir scene. The Songs from the Heart concert is the second part of a ‘rebranding’ effort by Trinity United, which aims to become more active within the community and to feel more inviting. In the fall they hosted a healthy living seminar, which was well attended. Though its held in a place of worship, the event is open and welcoming to everyone whether they attend the church or not. “There was a lot of enthusiasm about having hosted (the seminar) and there was a lot of interest in continuing and some suggestions for other workshops,” said Trinity United’s Penny McPherson, who is also a member of She Sings. The concert will see each group will take a turn performing jazz, broadway, gospel and pop songs and then they’ll all join together for a few ensemble pieces. “They bring their enthusiasm to our concerts,” McPherson said of the Kingston Youth Choir. Tickets for the Feb. 10 show are $20 for adults, $10 for students and free to anyone under the age of 12. They’re available at Ellena’s Cafe, Gray’s IDA or the church offices or at there door the afternoon of the show. Money raised from the event will go towards covering the cost of the healthy living series and other community outreach initiatives. The concert will begin at 2:30 p.m.